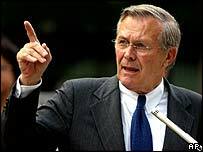 US Defence Secretary Donald Rumsfeld has won a "Foot in Mouth" award for one of his now legendary bizarre remarks. Mr Rumsfeld won the prize for comments made at a news conference in February last year which left observers baffled. "There are known knowns; there are things we know we know. We also know there are known unknowns," he said. The British Plain English Campaign annually hands out the prize for the most nonsensical remark made by a public figure. A spokesman for the organisation, which tries to ensure public information is delivered in a clear manner, said Mr Rumsfeld's remarks were typical of the kind of comments they were trying to prevent. "We think we know what he means," he told Reuters news agency. "But we don't know if we really know." Mr Rumsfeld fought off stiff competition for the award from actor turned California governor Arnold Schwarzenegger among others. Mr Schwarzenegger weighed in on the gay marriage debate with the comment "I think that gay marriage is something that should be between a man and a woman." And European Commissioner Chris Patten came close with his remark that the British Conservative Party had committed political suicide and was now living to regret it. Previous winners of the award have included US actress Alicia Silverstone and actor Richard Gere. But despite Mr Rumsfeld's rather outlandish mode of speaking, fans of the tough-talking US defence secretary argue he is misunderstood. There are dozens of websites dedicated to the "poetry" of Mr Rumsfeld and there is even a book, entitled Pieces of Intelligence, dedicated to interpreting his statements as a form of existential writing.